Truth be told, this was the first time I’ve ever cooked with rhubarb. I had it once in jam form at a cute little cafe on the Upper West Side, years and years ago, and once in a pie my very talented friend Kim was entering in a pie contest and forced us to taste-test after a hill workout (what a hardship!). But I had never bought it, never diced it, never tried to make it into something sweet. Which it is not — at all — raw and on its own. 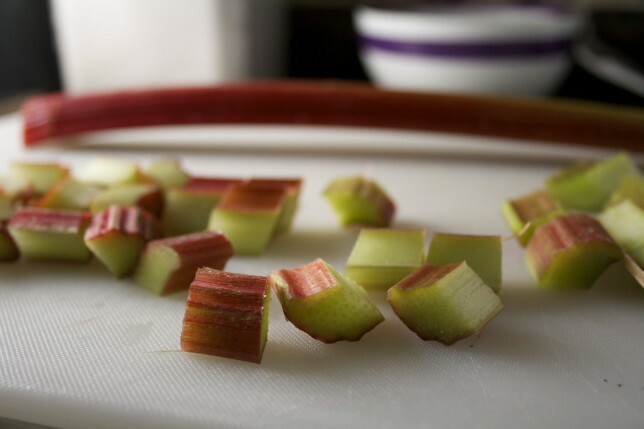 But indeed, combined with strawberries and sugar, and a bit of citrus perhaps, rhubarb melts into sweetness with a tang. Strawberries baked on their own are, of course, lovely. 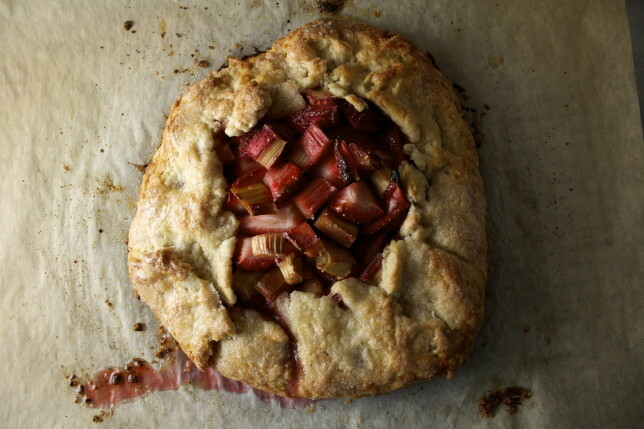 But rhubarb adds a depth I didn’t know they could have. Or maybe it’s the other way around. Maybe the strawberries bring the rhubarb to life. Either way, I am convinced of this pair’s greatness. This crostata — or rustic tart, if you will — is the perfect nest from which to highlight these shining stars. A simple, flaky, buttery base, easily combined and rolled out, allowing ruby red to peek out from the center of its messily folded edges. 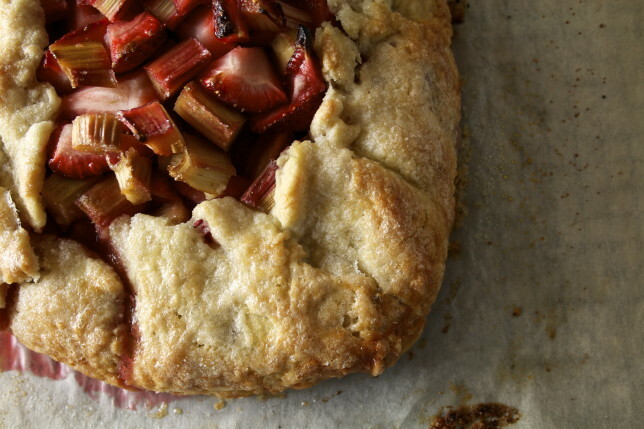 On most of the hot days in the last weeks, I keep thinking “I’m ready for fall.” But this strawberry rhubarb crostata kicks that thought right out of me. If the trade-off is bright summer fruit and crisp summer vegetables, fine, I’ll stick around. I’ll probably still complain, but at least my tongue and my belly will be happy. Some berry pie and tart recipes call for some sort of thickener. 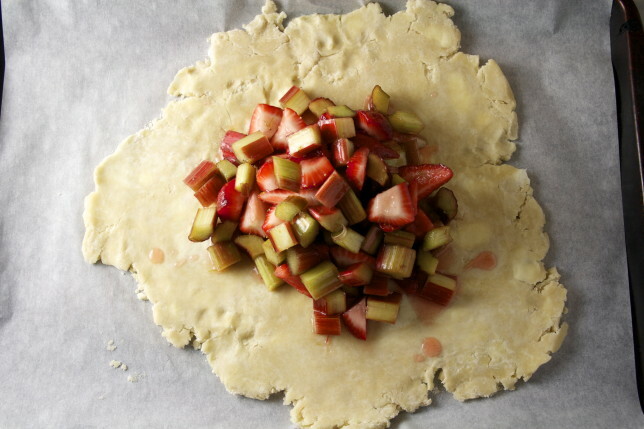 This tip from Dorie Greenspan cuts that ingredient out and does the trick beautifully: the strawberries and rhubarb are macerated and most of the sugary syrup is left behind when the filling is added to the crostata dough. Unlike, say, an apple pie, though, you won’t end up with dry fruit. 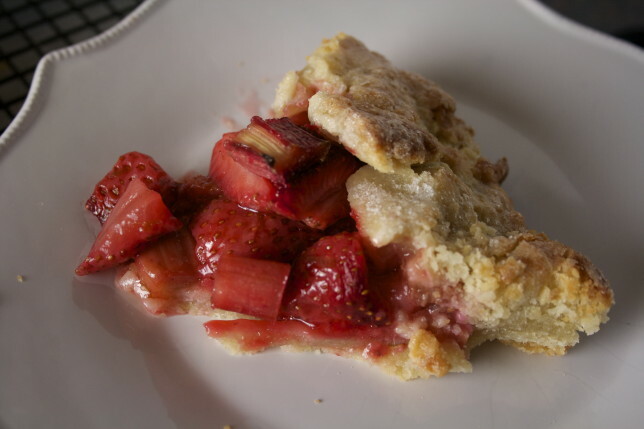 Trust me, the strawberries and rhubarb will continue to release more liquid as it bakes. Unless you have cracks in your dough, the filling won’t bubble over and out (but even if it does, that’s what the parchment is for), and will be the perfect consistency to cut. It won’t fall apart! It’s kind of amazing. And delicious. And perfect with creamy vanilla ice cream. Trust me on this. Let it be known that I am still terrible at rolling dough out into a circle. You will be much better, I’m sure. And if not, hey, that’s why they call it rustic. In a large bowl, whisk together the flour, sugar, and salt. Add the butter and work into the flour with your fingers (or with a pastry blender) until the mixture resembles coarse crumbs, with the largest pieces of butter the size of large peas. Slide into the freezer for a moment if the butter seems melty. Add 3 tablespoons of water and pull the dough together with a rubber spatula or fork. If the dough is too dry, add more water, 1 tablespoon at a time, until the dough holds together when pinched together in your hand. 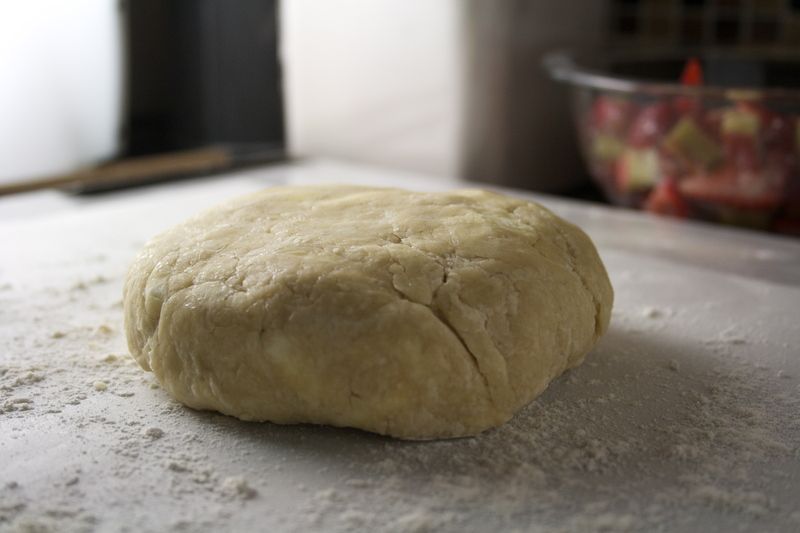 Turn the dough onto a clean surface and knead it gently into a disc. Wrap in plastic and refrigerate for 1 hour. 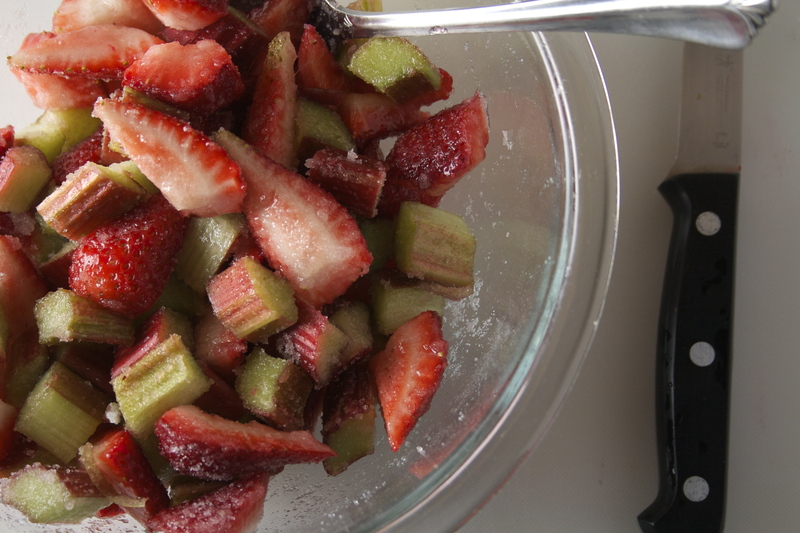 Combine the rhubarb, strawberries, sugar, lime zest and juice in a medium bowl. Leave to macerate. Preheat oven to 400 degrees. On a sheet of parchment or silpat dusted lightly with flour, roll the dough into a rough, 12-inch round, moving the circle a quarter turn every couple of rolls. Pinch the dough together if it cracks. If the butter seems melty at any time, return to the fridge or freezer for a few moments. When you’ve reached the correct size, gently transfer the parchment + dough onto a baking sheet and place in the refrigerator for 10 minutes. 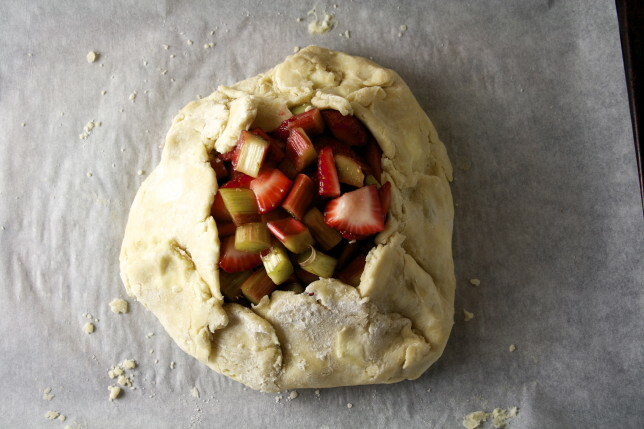 Using a slotted spoon, lift the fruit from the bowl and mound in the center of the dough, leaving a 2 ½-inch border. The strawberries and rhubarb will release a lot of juice — take care not to transfer too much liquid to the crostata. It will release even more during baking. Fold the dough border up and over the filling, pleating it along the way. Brush the dough with the egg wash and sprinkle with sugar. Bake the crostata until the crust is golden, about 40 minutes. Transfer the baking sheet to cooling rack and cool for 10 minutes. Carefully loosen tart from parchment using a spatula and slide it onto cooling rack. Let cool for 30 minutes, or until warm or at room temperature, and serve. Delicious with a scoop of vanilla ice cream. How much does this make? I am thinking of making this to bring my parents’ for father’s day … There will be 6 adults and a toddler present … how many times should I multiply this recipe? We had it three nights in a row, so you should be able to get six good pieces out of it. You could probably increase the fruit a bit, too (maybe by 1/2-1 cup), and just not have as much of a border — I piled it high here and probably left more than the 2 1/2 inches recommended. You could do 2 and still be good!